I wouldn’t say I have an addiction to sneakers, but it’s safe to say I have strong passion for them. Especially any sort of new adidas that comes on the market. 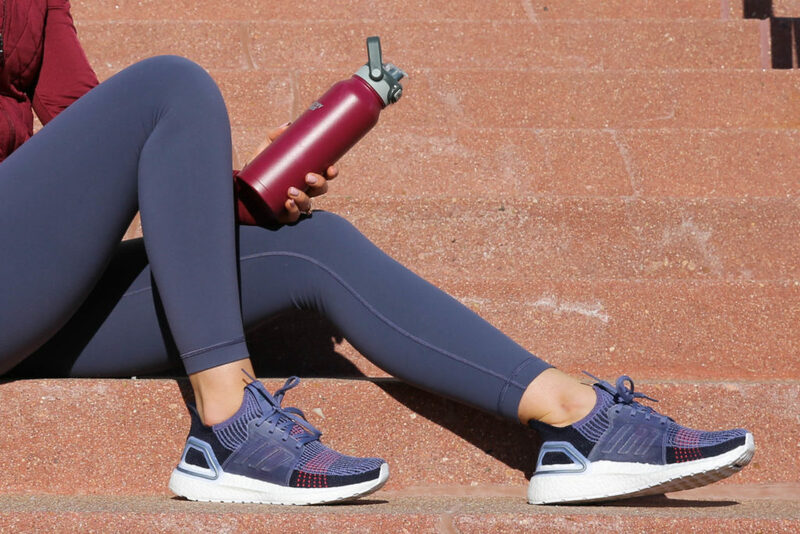 Adidas sneakers fit my feet so well and I find myself wearing them for workouts in the gym, runs and sprints, and even just most weekdays when I know I’ll be on my feet for quite a few hours. They are always comfortable, always cushiony and always supportive. And if you open my ottoman full of sneakers, you’ll find a TON of adidas UltraBOOST sneakers. So when the adidas UltraBOOST 19 released at Finish Line, I couldn’t get my hands on them quick enough! And luckily they did not disappoint! 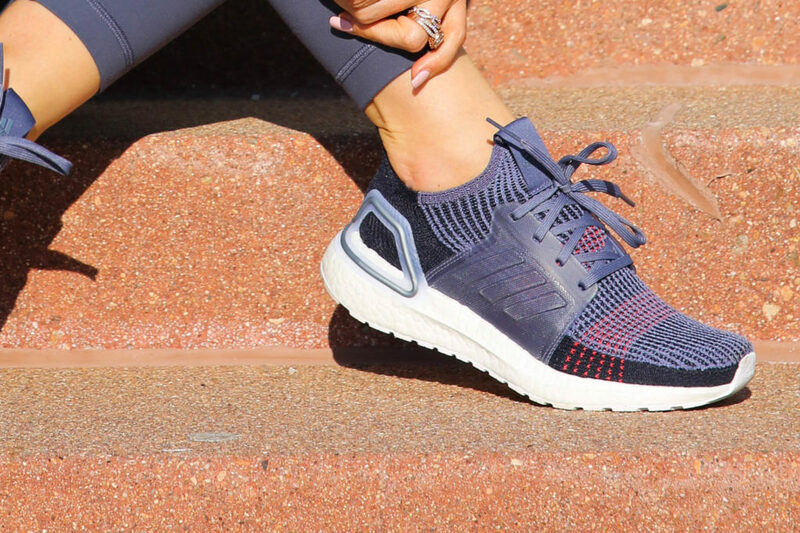 The adidas UltraBOOST 19 are made with Primeknit 360 material that is seamless throughout the entire shoe which lets the shoe stretch around your foot. So if you’re anything like me and have a slightly odd foot shape, the shoe will be super forgiving and make sure you’re comfortable with every step. And the 3D Fitcount molded heel helps create an optimal fit around your achilles for extra support. I don’t know about you, but I have an extra piece of bone in my heel (yes, my feet are just all around sketch) which means many shoes rub around my heel and cause blisters. But not in ANY of my UltraBOOST sneakers. And these adidas UltraBOOST 19 shoes are no different! No blisters for me! 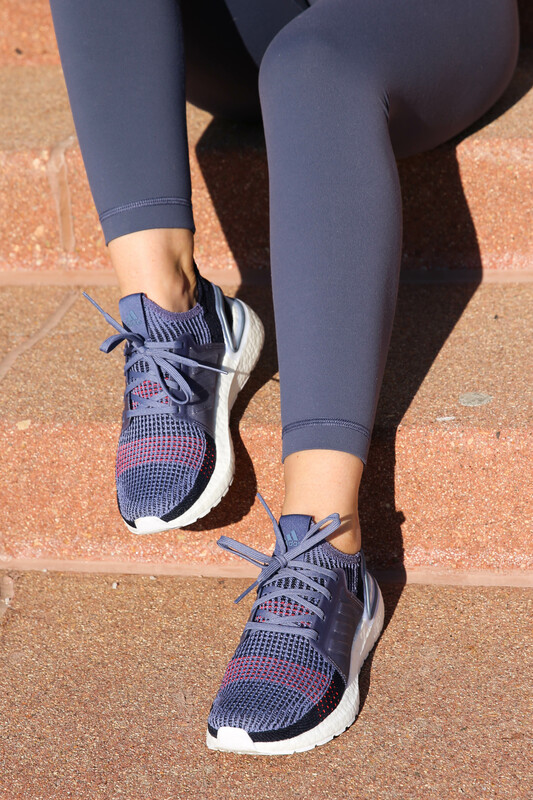 I wear these sneakers for any sort of workout – running, lifting, boxing…everything. The Plush BOOST cushioning provides comfortable impact every time you hit the ground. And the midsole hugs your foot to help give a springy feel. And because of the Primeknit 360 material, your foot stays in place with every pivot, turn and jump, which is why I love them for almost any workout! Your foot always feels secure no matter what you put your body through! And the best part is that they are cute enough to wear on a rest day! I just wore them yesterday while I sported joggers all day long, running errands, grabbing lunch, and working from a coffee shop. They are great for working out, but they are also great for normal day-t0-day casual looks! One of the reasons I ALWAYS turn to Finish Line first for any of my shoe needs is because they have such a huge stock of different styles, colors, and sizes, especially when it comes to adidas sneakers! And right now Finish Line is offering Free Express Shipping on the adidas UltraBOOST 19’s and it is automatically added at check out, which means it’s the perfect time to grab these sneakers before this deal ends! You are seriously going to LOVE these sneakers! And just a heads up – I went a full size down in these sneakers, they definitely run a little big. Hope you guys love them as much as I do! This post is brought to you by Finish Line. It contains some affiliate links and I may be compensated for this post, but all opinions are my own. This compensation helps with expenses to keep this blog up and running! Thank you for all your support!